I have also learnt from from doing my training that many people are still very confused about some things, like the procedural/substantive requirements of transferring Statements into EHC plans, the legal requirements for EHC needs assessments, or what should actually be where in the plans themselves - especially the ‘Outcomes’ section. 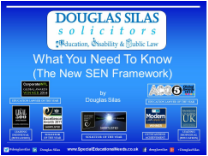 I have therefore already decided that I will be writing/running a new training presentation in the Autumn in relation to these topics, as well as covering other things (such as the requirements of the the new Code of Practice 2015/the Care Act/SEND Tribunal Practice and Procedure etc. - see more below regarding the last two things).